More than 100 family members, friends and supporters paid tribute to Spc. Luis D. Santos on Monday. Services were held at St. Catherine of Siena Catholic Church in Rialto then proceeded in a police-escorted motorcade to Riverside National Cemetery, where Santos was laid to rest. As kids, they forged a bond on church retreats and dreamed and chatted about the future. He was steady, confident. She bright and whimsical. Come adulthood, Lizzie Saldana opted for college and supported her close friend Luis Daniel Santos' decision to join the Army. "We still kept in touch," said Saldana, 20, squinting across the cemetery's rolling, grassy hills. "We filled each other in on how our lives were going." Saldana is in her second year at UC Santa Cruz, and Santos will forever be a 20-year-old war hero. Saldana and more than 100 family members, friends and supporters paid tribute to Spc. Luis D. Santos on Monday. Services were held at St. Catherine of Siena Catholic Church in Rialto then proceeded in a police-escorted motorcade to Riverside National Cemetery, where Santos was laid to rest. The Fontana High graduate was killed in Buhriz, Iraq, June 8 after an improvised explosive device went off near the Humvee he was riding in. Santos served as a cavalry scout in the 3rd Heavy Brigade Combat Team, part of the Army's 4th Infantry Division out of Fort Carson, Colo.
Childhood friends and Army comrades described Santos' toughness, big heart and tender empathy. 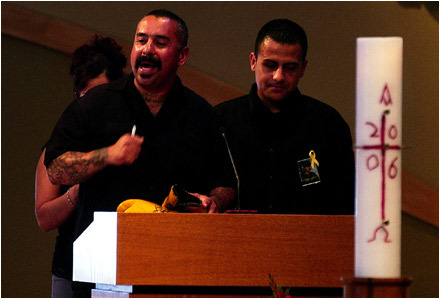 Ray Corona, who took "Danny" under his wing and taught him boxing when the fallen soldier was a wispy teen, told the crowd at St. Catherine's an anecdote to describe the "tough kid with a big heart." "I can remember he busted a kid up with a great combination and stopped to apologize in the middle of the fight," Corona recalled. Father Arturo Gomez, himself an Army veteran, led the ceremony, reciting excerpts from John 12 in English and Spanish. Childhood friend Jerry Vasquez told mourners the death of his boxing buddy had him gripped in profound indecision. "He was proud of what he was doing," Vasquez, 19, said. "I wonder what I should do with my life knowing he died for my freedom." Later, as people filed by Santos' coffin to receive communion, Vasquez stood with his head bowed, a pair of his friend's old yellow boxing gloves dangling by the laces draped around his neck. Vasquez asked friends and family to sign the gloves before he presented them to Santos' mother, Irma Santos, of Rialto. The procession filed out of St. Catherine's and became a caravan to Riverside National Cemetery with police and California Highway Patrol escorts. About 30 members of the Patriot Guard Riders, a nationwide amalgamation of troop supporters who attend funeral services of fallen soldiers, also made the trip. The Riders, most in heavily-patched denim motorcycle garb, remained outside St. Catherine's during the service and provided their customary two lines of members creating a tunnel of American flags as Santos' coffin was carried from the hearse to a wooden gazebo at the cemetery. Father Gomez, who made the trip to the cemetery, expressed dismay over the lack of turnout by local leaders. "I fear people may be getting too used to people dying young," Gomez said. A representative of Congressman Joe Baca, D-Rialto, Joe Rodriguez, attended funeral Mass at St. Catherine's. 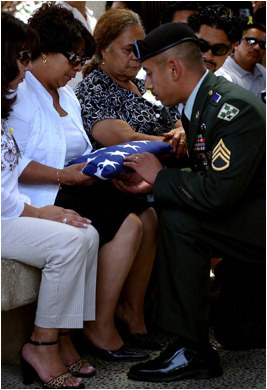 Mourners huddled shoulder-to-shoulder under the small cemetery gazebo as Army officers tightly folded the American flag that had draped Santos' silver coffin before presenting it to his mother. Santos' family also received the soldier's posthumously-awarded decorations, including the Bronze Star, Purple Heart and Global War on Terror Expeditionary Medal. Seven soldiers blasted three volleys of rifle fire, and a flock of doves was released, the lead dove representing Santos' journey into afterlife. A 2004 graduate of Fontana High School, Santos was on the track-and-field team and was engaged to be married to his high school sweetheart. He joined the Army straight out of high school and was deployed to Iraq last November. He was slated to come home on a two-week leave in late June. Santos was killed in a combat mission in Buhriz, a town about 40 miles northeast of Baghdad. Staff Sgt. Evis Gonzalez, 24, who served with Santos and is on leave with a knee injury he suffered in Iraq, called the zone a "very busy area." Everyone who knew Santos, civilian or military, spoke to his leadership instincts. People looked up to him at Fontana High, said Diego Rizo, 17, who said Santos was his role model on the track-and-field team. "I'm in total disbelief still," Rizo said, crying. "He was like my hero. Heroes don't die." 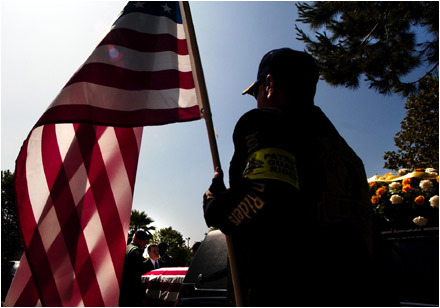 A member of the Patriot Guard Riders from the California chapter, holds a flag as the casket of U.S. Army Corporal Luis Daniel Santos is unloaded and taken into St. Catherine's Catholic Church in Rialto on Monday. 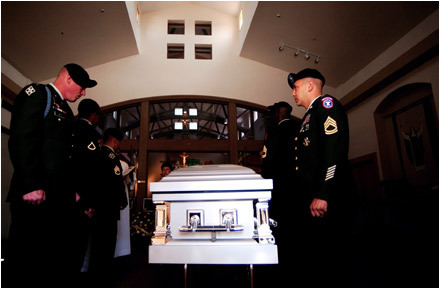 Members of the U.S. Army stand over the casket of U.S. Army Corporal Luis Daniel Santos before his memorial service. Former boxing coach Ramon Corona, left, and childhood friend Jerry Vasquez talk about their experiences with Luis Daniel Santos at his memorial service. 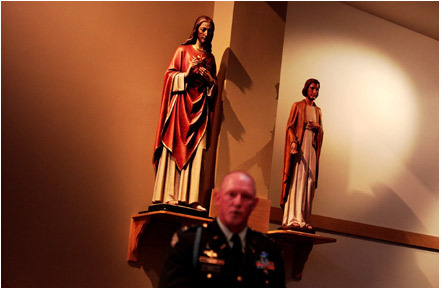 Statues stand over U.S. Army Captain John Hintz, the Company Commander of U.S. Army Corporal Luis Daniel Santos as he says a few words about his time leading Santos in IraqSantos. 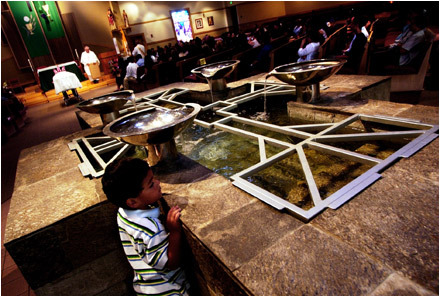 A young boy stands near a fountain of water during the memorial service of U.S. Army Corporal Luis Daniel Santos. 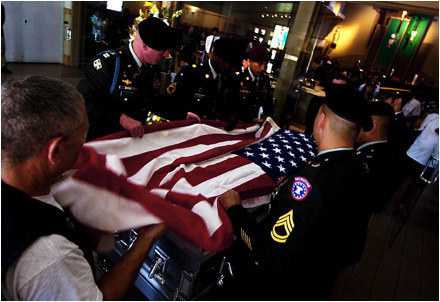 A member of the Patriot Guard Riders from the California chapter, far left, and members of the U.S. Army unfold the American flag over the casket of U.S. Army Corporal Luis Daniel Santos. 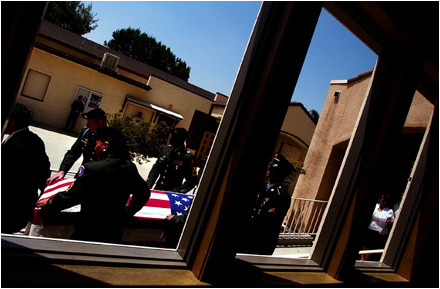 Members of the U.S. Army walk the casket of U.S. Army Corporal Luis Daniel Santos from St. Catherine's Catholic Church in Rialto following a memorial service on Monday. 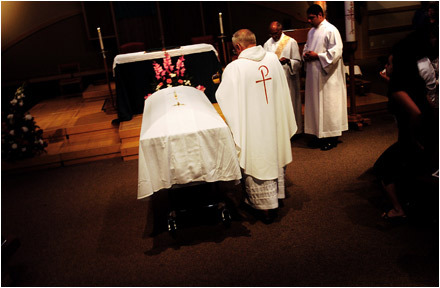 Father Arturo Gomez leads the memorial service over the casket of U.S. Army Corporal Luis Daniel Santos. 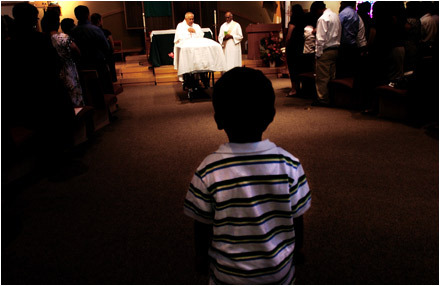 A young boy stands near the casket of U.S. Army Corporal Luis Daniel Santos. 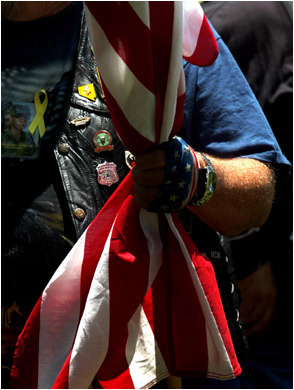 Jerry Wendt, 66, of the Patriot Guard Riders, holds a United States flag in preparation for memorial services for Army Specialist Luis Santos at the Riverside National Cemetery June 19, 2006. 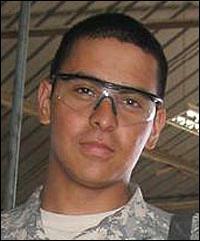 Santos, 20, of Rialto, was killed by a roadside bomb while serving in Buritz, Iraq June 8, 2006. 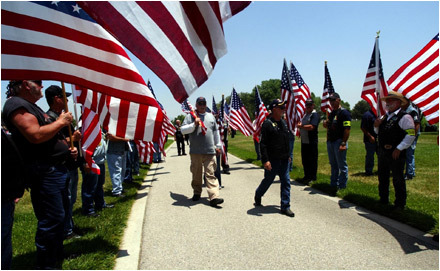 Members of the patriot Guard Riders line a walkway with flag bearers during memorial services for Army Specilaist Luis Santos at the Riverside National Cemetery. 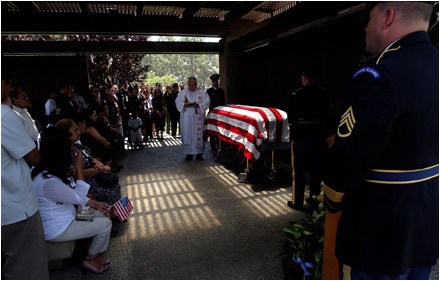 Father Arturo Gomez conducts memorial services for Army Specialist Luis Santos at the Riverside National Cemetery. 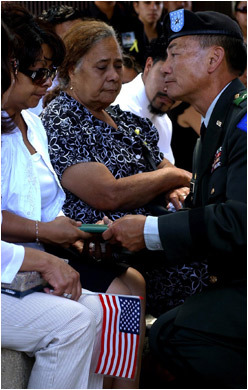 Irma Santos, left, recieves a Bronze Star Medal presented to her by U.S. General John Gong during memorial services for her son Army Specilaist Luis Santos. 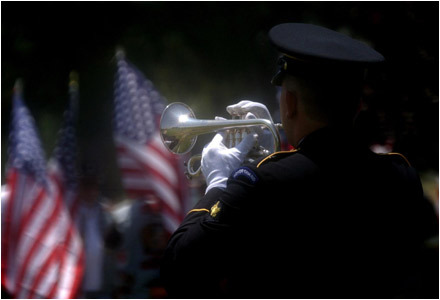 An Honor Guard plays Taps at the close of memorial services for Army Specilaist Luis Santos at the Riverside National Cemetery. Irma Santos recieves a flag presented to her by Staff Sergeant Evis Gonzalez during memorial services for her son Army Specialist Luis Santos. 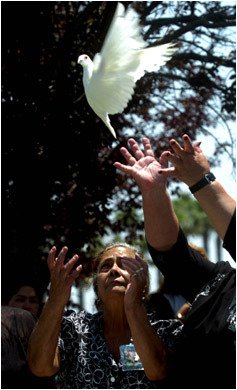 Family members release a dove at the close of memorial services for Army Specialist Luis Santos at the Riverside National Cemetery.